As a kid, this was the type of product that you wanted to find in the kitchen when no one else was around so you could drink it. It tastes that good. 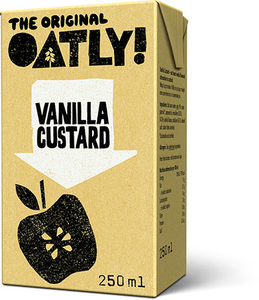 Now that you are grown up, you know such behaviour isn't very adult but you should also know that Oatly tried to make this so good that if you put a little on your finger, you would be tempted to revert back to those days when you were a kid and no one was in the kitchen to see you tip the jug and take a gulp. Of course, there is one big difference. This is made of oats, which means it is made on something that grows beautiful in the ground. Now over to the technical features section: you can whip it up to make it fluffy or just pour straight onto some berries from your garden or that apple pie you were thinking about making. This is a Chilled product and needs to be stored between 2-8 degrees Celsius. Oat base (water, oats 10%), sugar, palm oil, rapeseed oil, emulsifier (e472b, e472e), vanilla flavour, stabilizer (e415), salt, colour (beta carotene).